when I saw who had collected (and donated?) a most useful set of newspaper clippings I found at Harvard’s magnificent Widener Library. 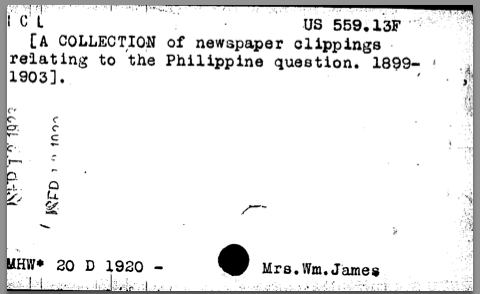 And to top it all: Somewhere in the middle of the reel (the collection was in microfiche format), I read an unnamed American woman’s eyewitness account of Apolinario Mabini’s funeral, in 1903. I experienced several varieties of religious experience, right then and there.